Recently I went to Cornwall to look after a cat that belongs to some friends. I thought it would be a pleasant break but it turned out to be a proper holiday. The weather wasn’t wonderful but the cat sat on my lap and let herself be stroked – mind you, in payment she wanted to be treated like an empress. And indeed, I did obey her every command! But as well as offering pet-therapy, my friends’ house is in a beautiful setting, right on the cliffs just north of Land’s End. I could sit on the couch with the cat on my lap and watch the weather sweeping in over the sea straight from the wild Atlantic Ocean – and it’s true quite a lot of wind, mist and rain did sweep in. But the house was full of interesting books – and the bus stopped right outside so I was able to visit St Ives and Penzance, and even made a 6 hour round trip – which was very scenic, of course – to Truro, where I got a lot of help from the Cornish Family History Society for my research into mum’s family. Half-way through my visit, I received a text from Liz the Carer, who went into see mum while I was away. She said all was well and they were sitting together, looking at the Postcard of Cornwall that I’d sent to mum. Unfortunately, only a couple of hours later, mum collapsed at the dining table while she was eating lunch. They were helping her walk into the lounge when she collapsed again and fell. The Doctor was called. In fact, by the time I got back the following week, the Doctor had been several times. When I got back and went in to see her, for the first time ever, she wasn’t sitting in the communal lounge but was still in her room. And she didn’t seem to be interested in my visit. She seemed happy enough, and quite peaceful. Said she was enjoying just sitting and thinking. She talked about me when I was a little girl, but didn’t seem to quite understand that I was that same person, now somewhat older. Sometimes she seemed to think she was talking to her sister and it’s true, I do look like my aunt. But, for me, the main issue was that her energy was very low. And indeed, she told me that she felt ‘worn out’. A couple of days later it was Mothers’ Day, and so my brother made the effort to come. I didn’t say anything to him but when he returned from visiting her, he was quite down in the mouth. She wasn’t like mum, he said. She seems to have lost her ‘bounce’. I agreed. Next time I went into the Care Home, the boss took me to one side. The Doctor had said there was nothing specifically wrong with mum that could be treated. Basically, mum has reached the last few months of her life. She is, literally, worn out. But while she doesn’t seem to be completely aware of her surroundings, she does seem calm and happy enough to sit and day dream and drift off to sleep. And she doesn’t think she’s stuck in the Home. No! Some of those day-dreams involve going out to the shops or down to the sea. Which can only be a good thing. She is very tough old bird, as they say. When I went in yesterday, I was amazed to find her dressed and sitting up in her chair. She thought she still lived in Brixton, in the house where she lived during the war, but otherwise she was bright and very chatty. She was still in her room, but they told me she’d been downstairs to the lounge the day before. So, although she does seem to have gone downhill, this new phase could go on for several moons yet! The edge of England! And the view from my friends’ cottage. The cat naturally wanted to sit in the middle of the map when I was trying to find my great-great-great grandparents’ farm! The mysterious St Michael’s Mount from Penzance and St Ives from the bus station! If you ever visit St Ives, don’t miss the wonderful Barbara Hepworth Sculpture garden! First of all, thanks for all the helpful advice re the dilemma I had a few weeks ago over dad’s love letters. In the end, I did tell mum I’d found them. She seemed to be having a good day and was quite like her old self so I told her I’d been sorting things out and had come across a box of letters from dad. Luckily, I found her lack of recognition amusing. I have after all changed quite a bit over the years. It seems the only babies mum cares about these days are my brother’s children. Ever since her first fall she’s been living in a time warp of nearly 35 years ago at a time when brother’s first wife tragically died and, for a while, his young, motherless children were cared for by their grandparents. And so Mum asks continually if the children are ok? They’re upstairs, she says, but they haven’t made any noise. I did ask if ‘the children’ were me and my brother, but no, it seems she does mean her grandchildren. It’s obvious she’s returned to an event which must have been deeply concerning for her. So, I reassure her that the children are fine. They are in their own home. Then I add: they are grown-up now with children of their own. In fact, the babies who come to see you are not my brother’s children but his grandchildren! I found this an incredibly lucid comment. And a possible window into what it’s like to have dementia. I told her: you’re like someone time-travelling with Dr Who in the Tardis. Sometimes being in the present while simultaneously, being in the past. As she’s a fan of Dr Who, this made her smile. These days, as I live alone and am somewhat isolated, I often think about the past even if it’s simply on the level of: how on earth did I get myself into this situation? And I’ve found certain memories isolate themselves and continually reoccur – apparently, they’re still very much alive in my subconscious. However, I do know that they are memories. Similarly, when I see a photo taken 40 years ago, I know it’s a photo of me yet at the same time, it’s a photo of someone who’s not me anymore. 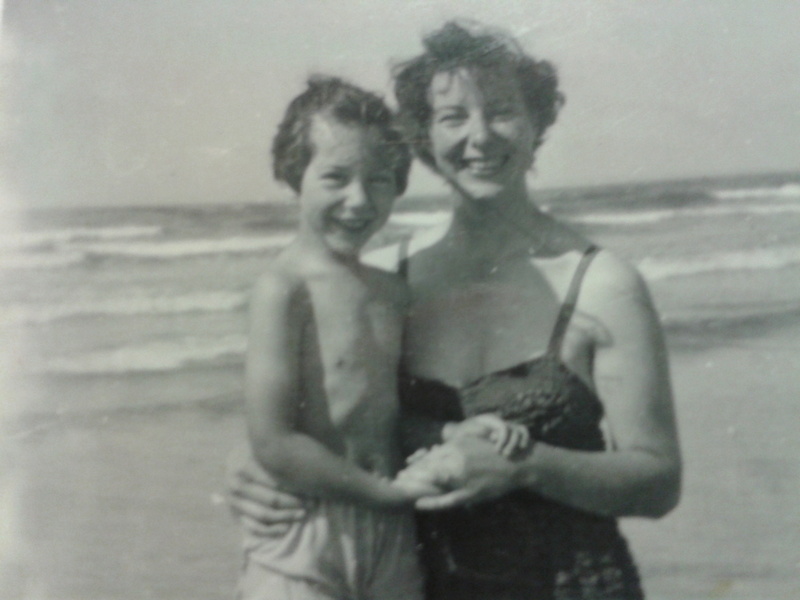 For mum, it’s not simply that she’s lost her short-term memory. Her memories, especially ones that are particularly meaningful, seem to have pushed themselves into the centre of her reality and are replaying themselves as if they are happening now. And she can’t separate the past from the present. But it was interesting she could grasp the concept of a dual universe; of the fact that she’s living in concurrent realities. But of course, the next time the subject comes up she’ll have forgotten all about our conversation and will ask me once again whether I’ve seen my father or if the children are all right?
. When mum had her fall in December, the hospital sent her neck scan to a major orthopaedic unit at a hospital about 30 miles away. The results had been inconclusive – they couldn’t tell whether it was an old neck fracture or a new one, so they decided she’d better wear a neck brace for between 2 and 6 weeks with a review after 2 weeks. As that would fall within the Xmas holiday period, I didn’t think much about it when they didn’t contact us, but as it drew near to 6 weeks, I asked the Care Home staff if they’d heard anything. Mum is incredibly uncomfortable with the brace: she can’t sleep properly, she can’t eat properly, she needs a straw to drink. It rubs on her chest and under her chin. With the result, said the Care Home, that she keeps trying to take it off. They assured me they’d been phoning the hospital but had not yet got any answers. When we were into the 7th week, they said the Doctor’s secretary had rung to say he would be looking at the case. But it had nothing to do with any doctor! The physios had put it on, following the orders of the main hospital. This Doctor wouldn’t know anything about it. I decided I was going to take matters into my own hands and put it in writing to the hospital that, if they did not respond soon, we were going to take the brace off anyway. At this point the paramedic from the local GP’s surgery got involved. I know him, he came to the house a few times when mum was still living at home. He said, leave it with him, he’d sort it out and indeed, he rang me back the next day. He had got in touch with the physio. She’d been on holiday, was shocked to hear nothing had been done and would quickly check and get back to him. That was on the Wednesday morning. On Wednesday night, mum fell out of bed again and smashed her head again. Apparently, she was rolling over, trying to take off the neck brace and rolled off the bed. I had a call on Thursday morning, had to drop everything and go off to the hospital. Mum had an x-ray, then a scan. It’s an ill wind, everyone said, because then maybe we can get this problem with the brace sorted out. But really mum should not have had this second fall. She bashed her face again to the extent that one of her eyes was completely swollen up, hurt her back again and for the first few days had to have an oxygen mask. She’s 98 – she doesn’t need this and quite frankly neither do I! The first day, I spent 7 hours at the hospital. At that point it had started to snow, so I phoned a cab and got home just before the snow became heavy. I know we don’t have a lot of snow compared to many places, but by the same token, we aren’t equipped for it. The next morning was below freezing and I got a cab into town as it was too slippery and dangerous to walk to the bus stop – by the evening, the snow had thankfully cleared although it was still bitterly cold. I can’t afford to take a taxi every time I go, so my other journeys to and from the hospital have been on the bus and they have been horrendous. It can take between 1 ½ hours and 2 hours each way, depending on the connections. Most of the time it’s been raining, with a bitterly cold wind. I’ve managed to grab a bit of shopping in between waiting for the bus – but add the travelling to spending several hours in the hospital – and it’s a pretty long day. That’s what bureaucrats forget. Even though I’m no longer mum’s official carer I’m still expected to drop everything, cancel appointments, whatever and head off to the hospital. (And I have to say, there are always quite a few other adult daughters sitting with their aged parent in the geriatric ward and they all have something to say about the lack of support from their other siblings). But the fact remains, if the hospital had only got back to us when they said they would, mum might never have had this second fall. When I saw mum in the hospital and she looked like she was at death’s door, a lot of thoughts flashed through my mind. As, amazingly, she now seems to be on the road to recovery, I’ve been unpicking those thoughts. The first one was: She can’t die yet! I haven’t cleared out the house. It’s too untidy for me to invite people for a funeral! When I moved down here, my stuff was stored in the garage. When mum moved into the Care Home, I moved my things out of the garage but I couldn’t put them away. To do that, I needed to make space, which meant clearing out mum’s drawers and cupboards. But I didn’t feel I could do that while there was any possibility she might return to live in the house. And of course, I had my surgery, developed the problems with walking etc etc so I didn’t have the energy, the physical strength – or the sense of psychological permission to get on with clearing out the place. However, things have changed and one of my new year resolutions was to make a start on this task of de-clutterng. I began with mum’s bedside cabinet. The top drawer was full of documents: some from banks, some from hospitals, some possibly important, some probably not. Some went into a pending pile, some in the bin. The second drawer was full of scarves – most of which will go to the charity shop. The lower drawer had a load of old nail varnish (in the bin), old hair rollers (in the bin), some quite nice hair slides which I don’t remember mum ever using but which I might use (in the pile that will be kept) and then, right at the very back of the bottom drawer: a mysterious box, quite old but with a rather nice design on the lid. I peeked inside: it was full of old letters. I needed my reading glasses before I could explore further so I put them to one side. When I did sit down with them, I saw the envelopes were addressed to my mum in her family name, that is to say – before she was married. My heart skipped a beat. Mum had a fiancé who was lost in the retreat to Dunkirk in 1940. Had she kept his letters secretly all these years? I opened the first one and saw it had been sent from an army camp in Yorkshire. My dad had been stationed in an army camp in Yorkshire. Indeed, he had proposed to mum while they were walking round the roman walls that encircle York. I relaxed. The letters were from Dad. I skim read a couple, not really wanting to pry and yet curious. I was a little surprised because Dad always said he wasn’t much good at writing. I wondered whether he had asked someone else to write these letters but they seemed too personal, very passionate declarations of love so I thought it unlikely he’d dictated them to someone else. I also realised I’d never really heard his voice. Dad never talked a lot, was a self-professed ‘man of few words’. When I was younger, he and I never really communicated. We tended to have rows about politics – or other things he didn’t agree with concerning the way I was leading my life. It was only in later years we really had anything that could pass as a conversation. I’d certainly never heard him speak like this: fluently, ardently. I looked deeper in the pile. Here the letters were now addressed to my mother as a married woman: his darling wife. They got married just before the Normandy Landings in 1944. Dad was part of the D-Day force; he had made his way through France, across the bridge at Arnhem and into Belgium. There were no letters from his billet in Brussels – when he stayed with a family with whom we kept in touch with for many years. In fact, I had dinner with them on a visit to Belgium in 1969. And they had told me, my Dad never went out, he only wanted to write letters to his beloved wife. The last letter in the box is from an army camp in England saying he was about to be de-mobbed. That he would be coming home and that this was the last time they would ever be separated. I got an insight into their relationship. I’ve always known their marriage was a love match but I wasn’t quite prepared for my dad’s ardent outpourings (all very chaste and romantic I’m pleased to add, so I didn’t feel I’d uncovered anything too embarrassing). But one thing does make me feel uncomfortable: apart from the letters, there was one other thing in the box – a photo of me as a baby. I was the outcome of this outpouring of love! That does feel weird, although I haven’t yet worked out why. I obviously can’t throw these letters away but how would mum react if I took them to show her? Would she be pleased to see them or cross that I had found them? I haven’t yet made up my mind about that. Mum and dad on their wedding day. Three weeks ago mum celebrated her 98th birthday. She was in fine form. The grandchildren came with their kids – her beloved babies. She was very happy to see everyone and, more to the point, remembered their visit. No, I told him, I didn’t know. I learned that mum hadn’t been very well that weekend, muddled in the head and unsteady on her feet so the staff at the Care Home had moved her to a room closer to where the night staff sit. Unfortunately, in the middle of the night mum tried to get out of bed. She can’t stand without help and needs to hold onto something at all times, but it seems she had an infection which made her confused, perhaps she was dreaming she could walk or was dancing. At any event she came crashing down and smashed her head on the bedside table. Initially, the hospital doctor said they were going to send her home that evening but, after an intervention by one of the physiotherapists and several more phone calls to me, they decided to keep her in for the night under observation. When I saw her the next day, I couldn’t believe they had even considered sending her home. She looked terrible, her face was purple and yellow with bruising and she was linked up to various monitors and intravenous drips. When I arrived, she was asleep and appeared to be in a sort of coma. They told me she’d had a bleed on the brain and a possible fracture in a neck vertebra. I really thought she was on her death bed. I texted my brother: You have to come ASAP! Eventually mum woke up; they even got her to sit in a chair, but she was still very confused. She had no sense of her surroundings, had no idea she was in hospital and appeared to be in a time warp -worrying about events that happened 30 years ago. The next day, when I went back, mum had been moved to an isolation ward because she’d had mild diarrhoea and been vomiting. Again, she was strapped up to machines and being dosed with intravenous antibiotics. It was a relief when my brother arrived, so I didn’t feel I had to bear all the responsibility. Mum was still very confused; she kept saying she wanted to lie down when she was already lying down. She kept trying to get up and out of bed when she was already in bed and indeed, had she managed to get up, she would have fallen again as she had no sense she might need some support to help her stand or walk. The third day, mum was calmer and the infection seemed to be subsiding. She was, however, still convinced she had fallen in the street outside the house of her best friend – who she first met during the War. And perhaps mum was remembering something that really did happen at that time, but she had no recollection of the Care Home or of falling out of bed. When I said that was what had happened, she got quite upset and accused me of lying; nor would she accept that her best friend had been dead for many years. While I was sitting with her, two physiotherapists came and fitted her with a neck brace which she must wear for the next few weeks. They did say the bleeding on the brain had stopped and what had showed up on the scan might be the shadow of an old injury. That evening they moved mum up to a general ward. When I got there on the 4th day, the nurse said they were sending her back to the Care Home that afternoon. This took me by surprise. I admit I was relieved. Not only because no one wants to stay in hospital any longer than they need to, but also because the round trip on the bus takes at least 3 hours. The weather is getting more seasonal, wet and windy while the sun sets at 4pm and with the dark comes increasing chill so the journey was exhausting me. However, I was genuinely amazed that mum was able to recover so quickly from what was a major incident and really impressed by her strength and resilience. It’s now over a week since she was sent Home. She’s still very tired, still caught in a time warp of about 30 years ago. She’s very, very uncomfortable in the neck brace. Also, she still looks dreadful, her face is green, yellow and purple like a Frankenstein mask for Halloween. I’ve gone into the Care Home nearly every day to make sure she’s ok. This is much easier to do than get to the hospital, but I’ve also been trying to get everything ready for Xmas. Believe me, I’ll be very glad when everything’s been done. Of course, I’ll also be glad if mum does settle down. I trust the Care Home to look after her but she’s so miserable at the moment and I wonder if at her age she’ll have the stamina to properly recover. If she does, then I think there really is a chance she’ll make it to a 100 and get that telegram from the Queen – so I’d better prepare myself for having to live here for some time to come. In the short term, I was concerned she’d be too frail to enjoy Xmas, not only because it’s Xmas but because the grandchildren were due to come on Boxing Day and she does love to see The Babies. I did not want to cancel their visit when, for all I knew, she’d be able to enjoy it. I held off posting this until I knew how it would go. In the event she was fine and able to enjoy seeing the children. She was due to see a pantomime last week which she would have thoroughly enjoyed but of course it was impossible for her to go. It’s such a shame she had this fall. I wish it hadn’t happened, but it did. Best wishes to you all for 2019! I understand a bit more about my mother. Once, when we were chatting, mum spoke of how she used to have to go to the pub on a Friday night to get her father’s wages before he drank them all. I knew this story already, but this time I heard something new: our neighbours didn’t have that humiliation, mum told me, and their father was only a bus driver – while we came from Good Stock! All my life, I’ve heard her saying this sort of thing, and never picked up on it – but this time I stopped mum. I asked her what exactly she meant by this strange comment? Her mother used to say it, apparently. But that was all mum really knew. She did, however, know that her mother had been partly brought up by her grandmother, that’s to say my mum’s great-grandmother, Mary. And that this Mary, who came from Cornwall, had been ‘a lady’. I myself knew that mum’s family, although poor, had considered themselves a cut above my father’s family who were rough and ready working-class cockneys. Nevertheless, they never had to go down the pub on a Friday night to stop their dad drinking away his wages! I realised that, all through her childhood mum had been made to feel dissatisfied; as if, in some obscure fashion, she’d been robbed of her birth right. I remembered that mum and her sisters always felt cheated that they hadn’t had the benefit of a good education, or the social advantages they felt they should have had. So, as I haven’t been in the mood to do very much else, I started to do some research into mum’s family history. What I’ve found out so far has been quite unexpected. I still don’t know how or why Mary travelled from Cornwall to London – which was quite a journey to undertake 200 years ago. But once in London, she does seem to have had a lot to do with a family whose surname is the same as her mother’s, so they could be her cousins. I hadn’t realised that this surname might possibly be aristocratic although apparently it can be, and I was surprised to see that, when this possible cousin, John Henry, signed the baptismal register for his eldest child, he revealed he had a string of middle names, all of them with aristocratic links. My first reaction was that they must be a very junior branch of an ancient family and were trying to maintain their prestigious blood ties even though they weren’t particularly wealthy. Apart from the coincidence of the surname, I can’t as yet prove a direct link between the two families, but they do seem to be intertwined: as witnesses at weddings; as beneficiaries and also executors of wills; Mary’s husband is godfather to John Henry’s son; and, at different times, they all live at the same address in South London. First my great grandparents, then Mary and her second husband – then John Henry who dies there and his son takes over the address. Sadly, the house was bombed in the war and no longer exists, so I can’t take a look at it. The family connection continued to the next generation. Two of John Henry’s children were witnesses to the wedding of one of Mary’s daughters. When she herself gets married, John Henry’s daughter lists her father’s full name and the string of names is even longer than I’d realised, perhaps because there was more space on the marriage certificate to list them all. And all of them with the same aristocratic ring. However, by now it’s clear that the family have little or no money. And so, again, I feel this family are clutching at straws. They might not be well off – but they have Bloodlines! Just like my grandmother. I know she inherited a couple of houses (worth a fortune at today’s prices!) a shop and a laundry, yet by the time my mother was growing up, they were poor. My grandmother had to go out to work as a cleaner and a cook. The businesses, the property all sold off – presumably because her husband was an alcoholic and a wastrel. But! She came from Good Stock! I started off mocking my mother for this claim; now I’m beginning to think there may be a grain of truth in it – a grain of truth that has blighted my mum’s life and stopped her appreciating all the good things she had, but which her mother brought her up to believe she was too good for. I don’t mock people who held onto this lifeline. My generation had more opportunity to make their own way in the world. There are still class distinctions, of course, but there are more chances to get on – even if you don’t come from the ‘right’ family. But the fact is, I think my grandmother’s pretensions have blighted my mum’s life and I’ve begun to feel I understand her a bit better. Mum keeps forgetting that my father is dead. In fact, she seems to think he’s living elsewhere in the Care Home. I tell her she must see Dad in spirit; that perhaps, he does come to visit her, to make sure she’s all right. For all I know this could be true. On the other hand, it could be mum’s way of dealing with life in the Care Home, to stop herself feeling quite so alone there. I say that he probably does! I say, they’ll be together on the other side, with a third brother who died a long time ago. I say ‘Maybe they’re all having a chat and a laugh.’ And then she’ll say ‘Frank! Is my Frank dead?’ And so we re-enter the same sad loop. If possible, I try to change the subject, remind her of how much she enjoyed going to the Royal Wedding (!). That usually works, at least for a while. Mum goes to the Royal Wedding! I haven’t been in the mood to write my blog for quite a while, but I thought this might be just the story to get me back in the swing of things. The last few months have been hard. I’m still recovering from my surgery and mum is living in the Care Home. She desperately wants to come back and live in her Own Home although she accepts that, for now, she must stay where she is as I’m unable to look after her. However, a couple of weeks ago, something happened that really cheered her up. Yes! She went to the wedding of Prince Harry and Meghan Markle. How did this happen? Well, she left the Home and got on a bus and the bus took her right to the church. I asked, didn’t the security people try to stop you going in? No, they didn’t. She thought that was because she’s so old. ‘I sat at the back!’ she assured me, ‘and saw them all. They walked right past me.’ I asked if she thought this had been a dream, but she was quite certain that it had been real. I asked how she’d got back and she told me, she’d just got the bus again. A magic bus, that’s for sure! Mum’s story continued: When she got back to the Home, she went into the dining room. Everyone was sitting down to lunch, so she just sat down with them, without telling them where she’d been. She giggled as she told me this, her face alight with happiness. I thought perhaps she’d eventually realise that she’d imagined it all, but two weeks on she’s still convinced she went and is absolutely thrilled to think she was able to attend. So now I just say, well mum, what a lovely memory for you! First of all, let me say it was worth taking the risk on mum’s birthday. She came back to the house. She saw the babies and the 2-year-old. Everything went well. The only glitch was when she was due to return to the Home. She was having a lovely time and had forgotten, of course, that she would need to leave. When I reminded her, she got upset, lashed out at me and my brother. She would never forgive us! We had lied to her! Etc etc. The same old accusations but when I’d worked so hard to make the event happen it was hard to keep calm while she screamed and shouted at me. However. But as we thought, as soon as the Favourite Carer arrived, mum became more docile. It was now 5pm, cold and dark so mum accepted it was getting late for her to be out. Later on, the Carer told me mum had been upset in the car, but she had driven along the sea front to show mum the Christmas lights and that had cheered mum up. The next day my brother visited her and she seemed fine. The day after I visited her and she seemed fine. She was pleased she had seen the babies – although at times I felt she remembered seeing the Xmas lights more than she remembered seeing the children! At any rate, she did not seem unsettled. She was looking forward to having a proper roast Christmas dinner at the Home – I don’t eat meat, so each year I’ve struggled to serve her such a traditional meal! In fact, all seemed to be going well – until this weekend. I’d spent a couple of nights in London at a Xmas get-together with some friends. I’d intended to pop into see mum on my way home but I was too tired. Recently, I’ve had a problem with my left hip. It’s inflamed and makes me limp. While I’ve been waiting to have some treatment, my right hip began to play up and I was reduced to a painful hobble. I couldn’t face hobbling back from the Home while wheeling my small suitcase, so I left my visit to Sunday. I didn’t feel like visiting mum then either! It was bitterly cold, sleeting rain, squally winds – although no snow. the lack of buses meant I’d have to walk there and back and I could only hobble along at a slow pace. Dreadful. But, thank goodness, I did make the effort. When I arrived, the staff member who opened the door looked very worried. She told me mum wasn’t in the lounge, as usual, but in her room. I was aghast. Mum never stays in her room. Was there something wrong? Nothing wrong with mum but the stairlift had broken down and mum was stuck upstairs. Oh, poor mum. She likes to be downstairs where all the action is, watching TV with other people, having carers going in and out. I found her all alone and very distressed. She was imprisoned! Trapped! How could I do this to her? I was quite sure she did feel imprisoned and trapped. So, although she has a regular visit from the Favourite Carer on Mondays, I also went in the next day, in spite of the pouring icy rain and cold (at least on Mondays there are buses). Mum seemed a little better in her spirits. They had got her friend who lives across the landing to stay up there with her and they were watching TV together. But being stuck upstairs has unsettled mum much more than the family visit ever did. Once more she’s demanding To Go Home. Of course, as she can’t get down the stairs, she can’t actually go anywhere. I’ve no doubt the staff in the Home are doing everything they can. They told me they tried – and failed – to get her down the stairs, and they are doing everything they can to get a mechanic for the stairlift. But for once, I’m upset as mum is: she feels cut off and isolated and, because of my hip it’s really painful for me to haul myself up and down the stairs to see her. Plus I’ve got so much to do for Christmas that it’s awkward for me to go in to visit her every day. I’ve now had an injection in my hip – it would be so nice if I could just rest and relax for a couple of days and let the treatment take effect but how can I? However today it’s clear I’ve caught a cold, probably from being out in the wet and freezing weather when I was tired and my resistance low, so in fact I have to stay at home as I’m now sick..
Did I really think life would get easier once mum was safely in a Care Home? Below, mum cuddles her third great-grandchild on her 97th birthday! We are going to take a risk. I’m writing this a few days before mum’s 97th birthday. In the last few weeks, her two grandchildren have both had new babies. She’s convinced they belong to my brother and his partner, who are both in their 60’s, and needs to be reminded that the new babies are my brother’s grandchildren. He did once, it is true, have a little girl and boy, but now they are grown up and have started families of their own. The young couples have offered to come and visit mum the weekend of her birthday. But two new-borns, a very active two-year old and seven adults can’t descend on the Care Home. They will have to come to the house. If mum wants to see The New Babies and her much-loved Great-Granddaughter, which of course she does, she can also come to the house. But she has to understand that she can’t sleep here. She will have to go back to the Care Home. I have explained this to her, and sometimes she seems to understand and sometimes she doesn’t. So, what to do for the best? I’ve discussed this with several people and most of them say it’s too risky. It will unsettle mum and she’ll get too upset. But I still think it’s worth the risk for her to see The New Babies, which she very much wants to do. A Carer who’s become like a family friend, takes mum out for a drive once a week. When I mentioned my dilemma to her, she immediately offered to pick mum up from the Home and bring her to the house, then collect mum at 5pm and return her to the Home. This has actually been my main concern. Because the problem will be when it’s time for mum to leave. If the Carer comes, mum will hopefully go with her without too much fuss – whereas she’s quite likely to play us up and give us a hard time. And so, it’s been arranged. Recently, one of my friends suggested a strategy they used with her own elderly mother: tell mum she has two homes now. Her Own Home is still here, and I am looking after it, but she can’t live there anymore. I am trying this approach, telling mum she’s going to visit her Own Home and see The Babies but, because she’s so old now (she does tend to forget just how old she is, bless her!) and needs so much looking after that she needs to live in the Care Home where she can be safe and cared for. In a few days, we’ll find out whether we were right to take the risk! This morning mum did say she understood that The Babies couldn’t come to the Care Home but that she could see them, if she came to the house. Fingers crossed it will all work out well. I really hope it does.